The ECEC Produce Stand opens in mid-June and features a variety of berries and vegetables that are grown on site using all-natural methods. The stand is conveniently located right on Highway 38, and is a popular stop for folks traveling between the Oregon Coast and I-5. 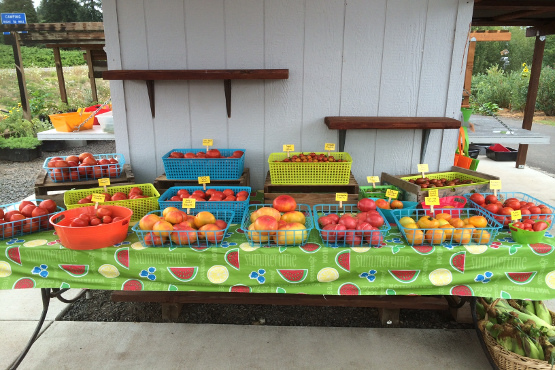 The Produce Stand provides fresh seasonal food for the community while providing job training opportunities in gardening and marketing for students in our Youth Employment Program. Approximately 15% of what we harvest is donated to area food banks. This summer we’re adding a message board for information about other locally grown food available in Elkton–check it out! We harvest early in the morning and the stand opens at 9 am. Come early for the best selection! Like us on FaceBook for updates on what’s in season. Have a special order? Contact us for bulk purchases for canning, etc. Before and after the summer season, you can find spring and fall veggies on the patio by the office.